The item Condemned to death, Cora Harrison represents a specific, individual, material embodiment of a distinct intellectual or artistic creation found in Evansville Vanderburgh Public Library. 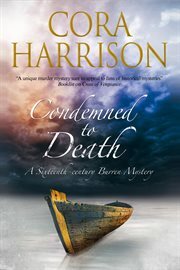 When Mara, Brehon of the Burren, is summoned to the sandy beach of Fanore, on the western fringe of the kingdom of the Burren, she sees a sight that she has never witnessed before during her thirty years as law-enforcer and investigating magistrate: a dead man lying in a boat with no oars. Immediately her scholars jump to the conclusion that the man has been found guilty of kin-murder. The Brehon sentence for this worst of all crimes is that the murderer be towed out to sea and left to the mercy of wind and waves and the ultimate judgement of Almighty God. But Mara notices something odd about the body, something which arouses her suspicions. And something familiar about the boat in which he lies. Soon she has embarked on a full-scale murder investigation. And gradually suspicion dawns that someone near and dear to her is involved in the murder.